Next up in the filler-series In Retrospect (when there aren’t any gigs on…), I wanted to have a look at an album I really enjoyed when it was released. However, looking back at the reviews and opinions at the time, I seem to be in the minority. 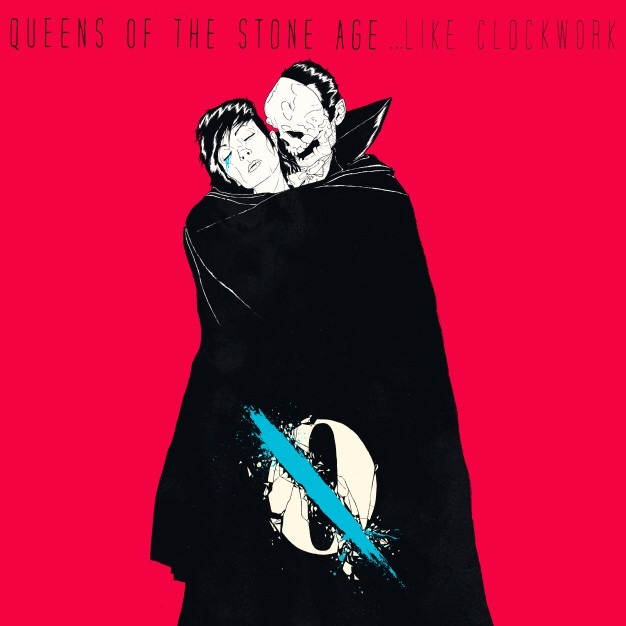 In 2013, Queens Of The Stone Age released their hotly anticipated …Like Clockwork, the follow up to 2007’s… tepidly received Era Vulgaris. Setting the album off, Keep Your Eyes Peeled isn’t a great start. Homme’s signature drone sounds unrefined and messy throughout the track, and the instrumental build up of the album opener is mediocre at best. Chugging guitars caked in reverb stab away at the back of the track, creating an almost hypnotic sense of monotony. Eventually, the song gives way to more harmonised droning and we’re left wondering what just what the last five minutes were in aid of. The very antithesis of an album opener, the track fizzles out unceremoniously, smacking of a filler track that should have been tacked onto to the other side of the disc, if at all. Next up, I Sat By The Ocean. Starting with incredibly suspicious similarities to a certain brit-pop group’s biggest hit, the song is catchy and full of the strange guitar work we know and love from Josh Homme. Behind the band’s groove, a synth can be heard that gives the track a real edge. Clocking it at around four minutes, the song is snappy, to the point and sticks in your head. So this is where the album really begins? The Vampyre Of Time And Memory is another slow burning, piano led blues exploration with a bass heavy groove. Unlike the first track on the album, the song continues consistently throughout, layering a myriad of synth heavy lines above it’s fuzzy guitar work. While it isn’t a standout, the song is still an interesting listen, and one of the better filler tracks on the album. However, following this up is the wonderful If I Had A Tail. My personal favourite track from the album, guest drummer Dave Grohl (yes, that Dave Grohl!) pushes the powerfully light beat throughout, with a crooning guitar line mimicking Homme’s vocal melodies. Lyrics here are also impeccable, nonsensical yet incredibly fitting with the track’s throwback to the band’s stoner rock roots. Old QOTSA fans will feel right at home here. Main single My God Is The Sun hits the listener like a smack in the face with a lightning riff, followed by a full band break into bass and drum led verses before catchy choruses and a half time bridge. The song is excellent, and stays in your head for weeks. Whilst lyrics here aren’t the most impressive, the band put in a performance to rival anything the band have done in the past. When the band moved toward a more commercial rock radio sound, they clearly brought some of their venomous bite with them. The song roars past, another highlight to follow the last. Kalopsia, just past the mid point of the album is another stand out. While slow and relatively uneventful, it’s placement on the track listing is sheer genius. A calm, carefully considered set of verses give way to a rough, scratchy chorus featuring none other than industrial heavyweight Trent Reznor. The album is peppered with stars throughout, and we haven’t even heard the biggest one yet. The juxtaposition of Homme’s soft, warm vocals contend with Reznor’s harsh, unforgiving style perfectly. As the track ends, we are treated to what sounds very much like a guitar calming to a slow, relaxed solo. The guitar really breathes throughout the track, and the end provides us with a very gentle send off. Track seven, Fairweather Friends is a tricky one. Distorted guitars guide an eery Homme toward a piano laden, fuzzy chorus, what follows is a relatively lacklustre song that could have been cut down by at least half and been much more effective. Chanting in several sections of the piece are a nice addition, creating a vocal dynamic unique to the track, but it’s wholly forgettable. After the incredibly strong trio of the previous two, it’s easy to see why. It’s even easier to see why after we get to the next track, Smooth Sailing. The penetrating, distorted guitars dance along a simple beat as Homme raps and moves with the rest of his backing, showcasing his diversity to a fine degree. The song is the most interesting on the album, and even when it gives way to a more generic bridge the third time around, a deliciously swaggering solo gives the song an even stronger injection of sexuality, an incredible pleasure on the ears of the audience. Ending with an almost claustrophobic climbing scale, the boys show just what they’re capable of before bringing us back down to earth for one more round of that gorgeous riff. From strength to strength, we move onto I Appear Missing, yet another stand out on the album. A hypnotically draining chorus led by slow, bluesy verses transport you to a land that you and only you can own. The fragility of the picked guitar lines, clear, simple bass line and soft vocals from Homme come together to form a lullaby only Queens Of The Stone Age could write, and it’s beautiful. The band manage their strengths and subtleties toward an outstanding finish, writing yet another stunning track as we come to the final song of the album, title track …Like Clockwork. Homme, showcasing his incredibly impressive falsetto vocals begins the end of the record over Elton John’s (yup!) soft, comforting piano line. A strong end to the album, even if it’s far from a stand out. A crescendo of intensity halfway through the track brings us back to the calm proceedings with which we began, with a heavy bass line threatening to boil over any moment. Lyrics here are a highlight, playing with common misconceptions and leaving the listener pessimistically optimistic. So, this time it’s all a little different. I’m sure a lot of things I’ve said in this piece make very little sense, but this truly is an album you need to hear for yourself to truly understand it’s nuances and individuality. As for the bad reviews, I could understand somebody’s problem with the album. Gone are the QOTSA that we knew, and for many people what we now have is a bastardised, commercial rock radio band like many others. But for the rest of us, the exploration into the unknown yields rewards that few other bands could give. If you want something different, I highly recommend …Like Clockwork. Posted in Music, UncategorizedTagged Queens of the Stone AgeBookmark the permalink.